Before we get to this sauerkraut sandwich recipe, a note on how I got here. Being a foodblogger has afforded opportunities to explore and dive into food on a whole new level. Becoming familiar with new-to-me ingredients and ways of cooking has broadened my palate and enlightened my world view on food. 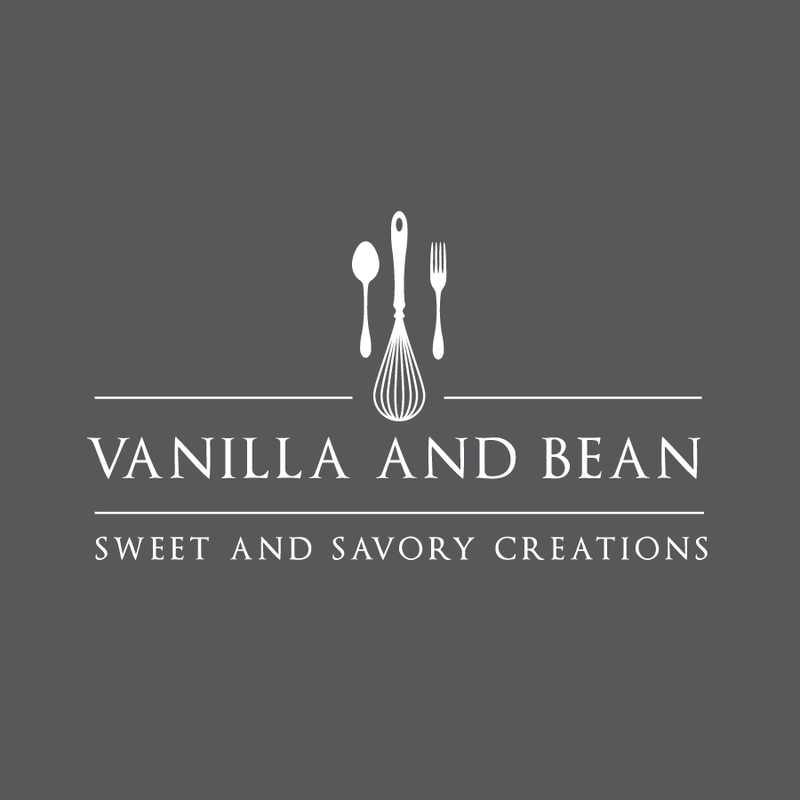 Recipe development and food photography is my work, now, so exposure to all things food is on the daily agenda. For recipe inspiration, I thumb through the pages of magazines, cookbooks, the Vegetarian Flavor Bible, and scroll through Pinterest and Instagram. But most of the time, I gain inspiration from the food that the farm stands are offering and whatever is in season. I’m frequently asking, how can I use this ingredient in a recipe. But then I spied some sauerkraut… and had just made a new loaf of sourdough (I’ve been investigating multigrain). I had everything I needed to make an easy beet and sauerkraut sandwich recipe! Now, I would have never thought to put beets on a vegetable sandwich. Really. And I use to despise sauerkraut. But my taste buds have matured… as has my appreciation for fermented foods. 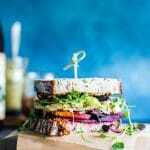 You just need a few simple ingredients to pull this mouthwatering easy vegetarian sandwich recipe together! Bread – I love sourdough, but whatever your favorite bread is is the best bread! Roasted and peeled beets – I have a tutorial on How to Roast Beets if you need. This vegetable sandwich is simple to pull together after the beets are roasted. I usually roast a batch on the weekend and eat on them throughout the week. This veg sandwich is texture rich, sweet, spicy and sour mouth party. Woah! It’s all in there. 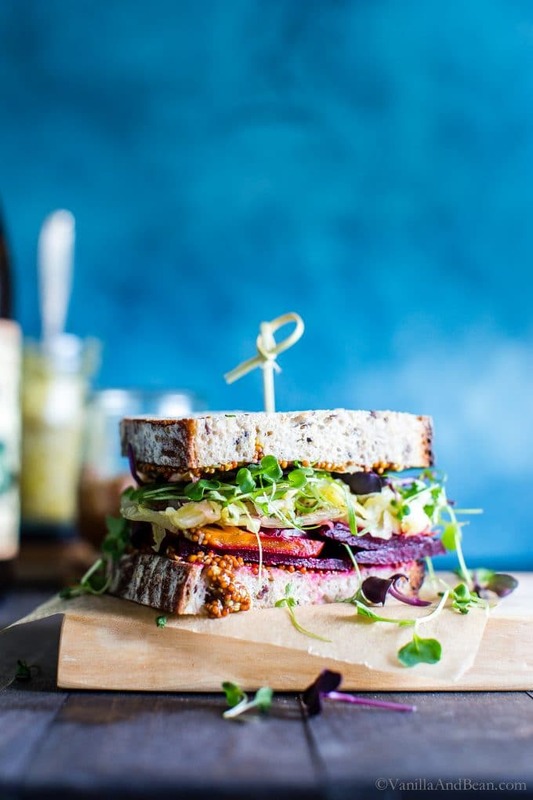 And the best part, this beet and sauerkraut sandwich comes together with four basic ingredients. Now that’s what I call easy peasy! Beets can be roasted up to four days in advance and stored in the refrigerator. Keeping these on hand means I can pull a quick salad together or make a fabulous veg sandwich! Although I love homemade sauerkraut, it’s generally an ingredient I purchase. Pickled Planet is my favorite brand. Don’t skimp on the mustard! Whole grain mustard gives this sandwich a tangy and full bodied flavor that you’ll return to again and again. I like Maille. Bread sourdough, seedy, homemade... use what you love! Prepared Whole Grain Mustard the spicier, the better! Preheat oven to 400F (204C). Trim the greens to the base of the beets and save for another recipe (I love them in green smoothies!). You won't need the greens here. Trim the tail and discard. Place beets in an oven proof baker or pot with a lid and fill with 1/2" - 1" water, cover and roast for 40-50 minutes or until fork- tender (the larger the beets, the longer the roast). Once the beets are out of the oven, allow to cool until they can be handled. There are two ways to approach beet peeling. Use a vegetable peeler and gently remove the skin or simply slip the skins off. Your choice. Once the skins are removed, slice the beets into thin (about 1/4") discs. Refrigerate for up to three days. Slather two slices of bread with a generous schmear of mustard. Arrange a layer of beets, overlapping a bit, then top with a few heaped tablespoons of sauerkraut. Sprinkle the top with sprouts, microgreens or lettuce. Enjoy right away. If using prepared sauerkraut, look for organic brands in the refrigerator section. I just discovered a brand I love called Pickled Planet (not sponsored). This was easy, different, and so delicious. There are not many vegan lunch options where we live in West Texas and the ones that exist are a result of removing about 5 items from an existing menu item (yes 99.9% of all menu items here have either meat or dairy by default). We have been in a rut of hummus and sliced garden veggie sandwiches and chickpea salad for a while. This was quick to throw together and so refreshing from the norm. We had it with your fennel and white bean soup, which was also delicious. I’m always looking for vegetarian ways to eat sauerkraut and this was delicious! Bought roasted beets and toasted the breD. Had a sandwich 5 min after I got home from the store. Thank you!! Love reading your note Sarah! Who knew? I love this combination of flavors too! Hey Sam! Thank you for coming back and leaving a note. So simple, right? So happy you enjoyed it! I’ve been drooling over this ever since it was posted. Do you serve the sandwich alongside anything, or do you find it satisfying enough on its own? Hi Claudia… thank you for your note! I find it satisfying on its own, of course with a side of Kettle chips, or carrots and hummus ;) . I hope you enjoy it! Thank you so much, Traci, for your lightning fast response. I followed your advice, and served it up with a side of Kettle chips, and oh my gosh, this was THE most perfect sandwich I have ever eaten. I don’t think anything will ever be able to compare in that department. This recipe is dynamite. You got it, Claudia! Thank you for your note. Can you believe how satisfying it is? Now, if you like this one, have you tried my Smashed Chickpea Sandwich? So happy you enjoyed it with those Kettle chips :o !! Seasonal produce is indeed the best inspiration of all. 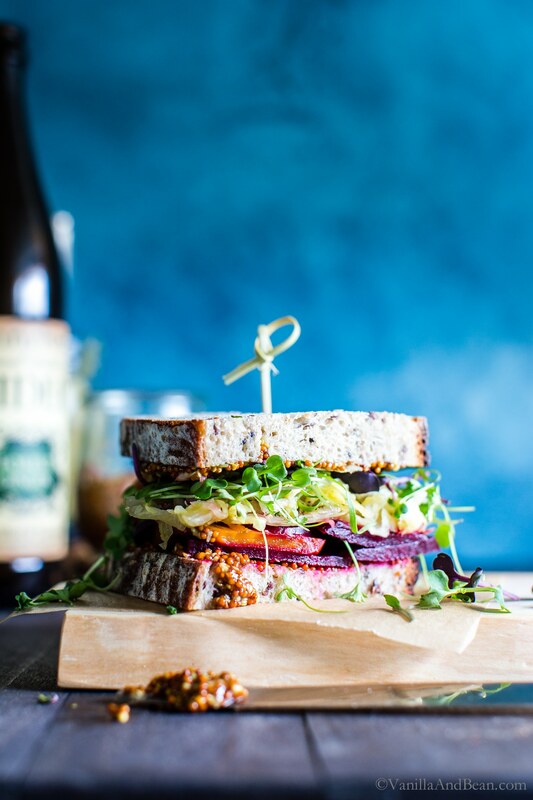 I often struggle to find ways to cook with beets and I love the idea to add them to a sandwich. Plus you can’t go wrong with sourdough and sauerkraut. So much deliciousness going on in this sandwich! And I love the color choices too. Gorgeous work, Traci! I’m with you, Sarah. I tend to only enjoy beets by roasting or pickling them and putting them on salads or just eating them out of the jar. But here’s another way to love beets! Hooray! When I think of “vegan,” I don’t usually think sandwiches, but I will now! This was so tasty – beets in a sandwich, who would have thought? Thanks for the recipe. I’m with you! Who would have thought? LOL – thank you for your note VK! So happy you gave it a go! Traci, you are amazing!!! What a fabulous looking sandwich with home made sourdough. Absolutely love all the colors and the beet, my favorite. I love using sauerkraut in sandwiches – usually my go-to is the Reuben but this looks absolutely delicious! Thank you so much for sharing, I can’t wait to make this for my family! Oh wow – I’d never thought about it as a reuben… ! But I can see… now I just need to whip up some thousand isl. dressing (!!) I hope you and your family enjoy it. Thank you for your note, Billy! Thank you love…. I simply love homemade bread! And beets on a sandwich? Who knew? 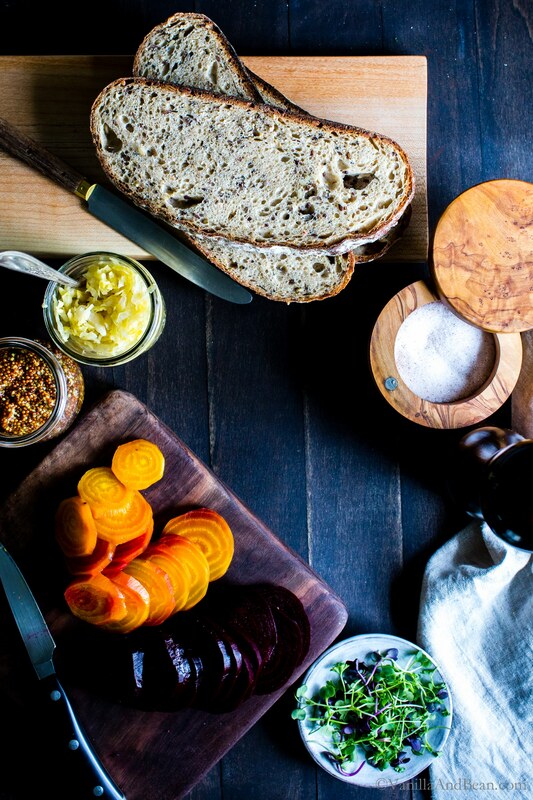 I LOVE beets, Traci – and never thought of putting them into a sandwich – this is brilliant! Ferment foods are very in right now – so sauerkraut makes a tasty addition to this sandwich. And yes to grainy mustard! Love this – pinning now to share! 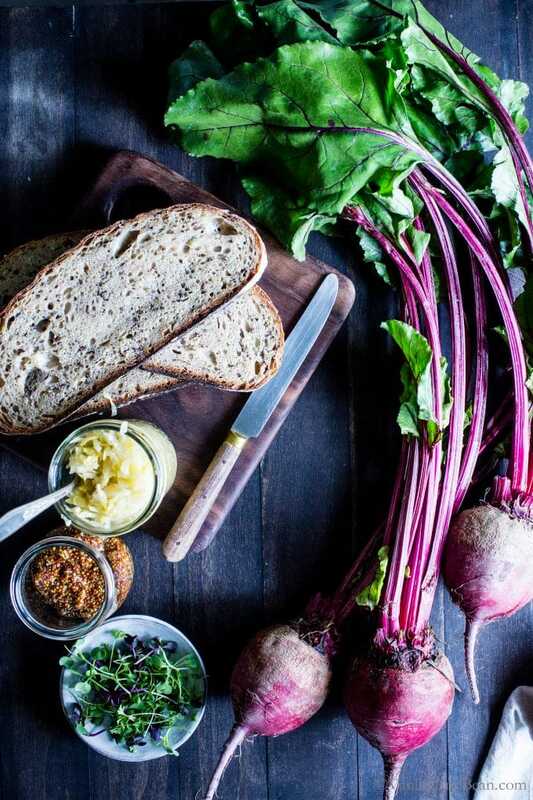 This has been my favorite kind of sandwich forever (we call them beet rubens) – glad to see others enjoy it as well! It is such a fantastic combination. Also, if you have access to a smoker and you smoke the beets, it brings in a whole new level of flavor. Oh my goodness, who knew? Beet rubens! I just got a little smoker box for the grill last summer. I’ll have to put a few beets on next time I use it! Thank you for your tip, Kate! This is so creative. I would never have thought to put all these goodies together. I’m a huge fan of beets but don’t make them a lot bc they are so messy. This sandwich makes it all worth it! Thank you Karen! Indeed messy, but worth that mess! I don’t mind it and tend to batch cook them so I get messy once and then the work is done! What an incredible sandwich, this needs to be on the menu for this weekend! Hey Laura! Thank you my dear! DO IT! So funny, I had your chickpea dill pickle sandwich beside me last night as I was making my grocery list for the weekend (if I were a more organized soul, I’d shop once a week? is that what normal people do ;o anyway that’s not me). I like how you’ve combined the roasted beet with sauerkraut – it sounds so tasty yet uncomplicated. I’ve yet to find a brand of sauerkraut that I like tho (I’ve tried a few from whole foods) any recos? Love the contrasting colors in your beautiful beets and the turquoise background Traci, so pretty! Wow! What a sandwich Traci. I have always loved sauerkraut. I’m late to the beet train though, but I’ve been working on it. I love being able to create recipes and put things together most people wouldn’t think of, but would enjoy. Thanks for sharing this delicious combo. Your photos are leaving me so hungry. They’re just gorgeous! Happy weekend to you and Rob. Hehe! Well said, Mary Ann… I find beets to be so enjoyable. Most of the time I eat them straight from the fridge after roasting or pickling. They’re just fabulous! 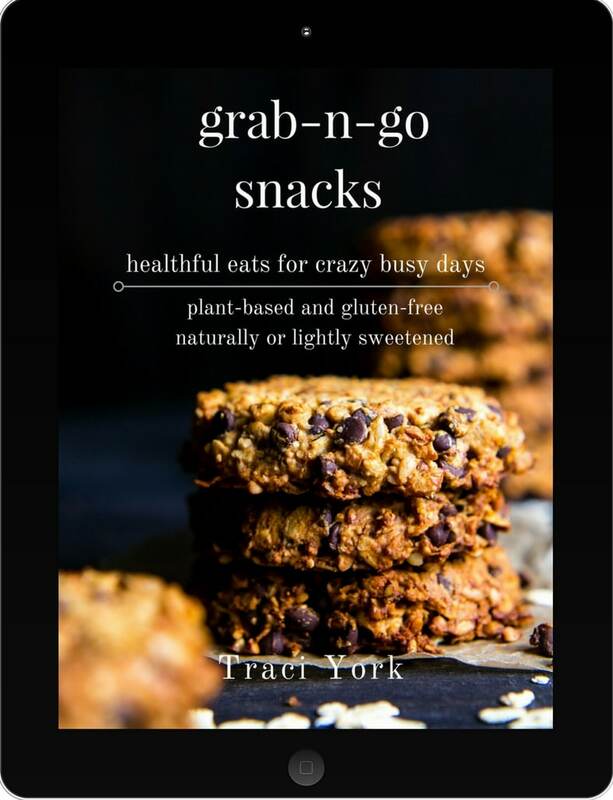 This looks fabulous, Traci! I actually puts beets in grilled cheese sandwiches (with goat cheese) and I love it. Never tried with sauerkraut. I need to do that next! Isn’t it so fun to play with new combos?!?! Glad we get to do this as a job. Lol. Enjoy your weekend! Omgeeee!!! Goat cheese!? I’m thinking now I remember that sandwich! 🤤 No doubt… a lot of work, but yes what fun! !